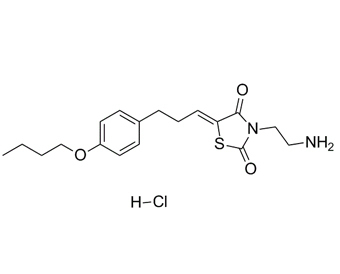 K145 is a selective sphingosine kinase-2 (SphK2) inhibitor and anticancer agent. K145 inhibited the activity of SphK2 in a dose-dependent manner with an IC50 of 4.30Â±0.06 ÂµM. K145 also exhibited inhibitory effects on the growth of U937 cells as well as apoptotic effects in U937 cells. K145 exhibits comparable in vivo anti-tumor activity to tamibarotene, while concomitantly exhibiting less toxicity in this U937 xenograft cancer model.
. Liu K, et al. Biological characterization of 3-(2-amino-ethyl)-5-[3-(4-butoxyl-phenyl)-propylidene]-thiazolidine-2,4-dione (K145) as a selective sphingosine kinase-2 inhibitor and anticancer agent. PLoS One. 2013;8(2):e56471.